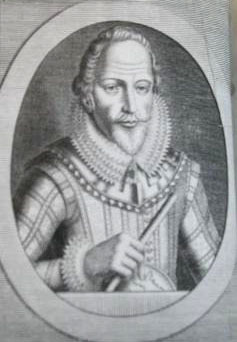 John Davis, or Davys, one of the chief English navigators and explorers under Queen Elizabeth I, especially in Polar regions, was born at Sandridge near Dartmouth about 1550. From a boy he was a sailor, and early made several voyages with Adrian Gilbert; both the Gilbert and Raleigh families were Devonians of his own neighborhood, and through life he seems to have profited by their friendship. In January 1583 he appears to have broached his design of a northwest passage to Walsingham and John Dee; various consultations followed; and in 1585 he started on his first northwestern expedition. On this he began by striking the ice-bound east shore of Greenland, which he followed south to Cape Farewell; from there he turned north once more and coasted the west Greenland littoral some way, until, finding the sea free from ice, he shaped a "course for China" by the northwest. In 66° N., however, he fell in with Baffin Land, and though he pushed some way up Cumberland Sound, and professed to recognize in this the "hoped strait", he now turned back (end of August). He tried again in 1586 and 1587; in the last voyage he pushed through the straits still named after him into Baffin's Bay, coasting west Greenland to 73° N., almost to Upernavik, and from there making a last effort to find a passage westward along the north of America. Many points in Arctic latitudes (Cumberland Sound, Cape Walsingham, Exeter Sound, etc.) retain names given them by Davis, who ranks with William Baffin and Henry Hudson as the greatest of early Arctic explorers and, like Frobisher, narrowly missed the discovery of Hudson's Bay via Hudson's Straits (the "Furious Overfall" of Davis). In 1588 he seems to have commanded the "Black Dog" against the Spanish Armada; in 1589 he joined the Earl of Cumberland off the Azores; and in 1591 he accompanied Thomas Cavendish on his last voyage, with the special purpose, as he tells us, of searching "that north-west discovery upon the back parts of America." After the rest of Cavendish's expedition returned unsuccessful, he continued to attempt on his own account the passage of the Strait of Magellan; though defeated here by foul weather, he discovered the Falkland Islands. The passage home was extremely disastrous, and he brought back only fourteen of his seventy-six men. After his return in 1593 he published a valuable treatise on practical navigation in The Seaman's Secrets (1594), and a more theoretical work in The World's Hydrographical Description (1595). His invention of back-staff and double quadrant (called a "Davis Quadrant" after him) held the field among English seamen until long after Hadley's reflecting quadrant had been introduced. In 1596-97 Davis seems to have sailed with Sir Walter Raleigh (as master of Raleigh's own ship) to Cadiz and the Azores; and in 1598-1600 he accompanied a Dutch expedition to the East Indies as pilot, sailing from Flushing, returning to Middleburg, and narrowly escaping destruction from treachery at Achin in Sumatra. In 1601-03 he accompanied Sir James Lancaster as first pilot on his voyage in the service of the East India Company; and in December 1604 he sailed again for the same destination as pilot to Sir Edward Michelborne (or Michelbourn). On this journey he was killed by Japanese pirates off Bintang near Sumatra. A Traverse Book made by John Davis in 1587, an Account of his Second Voyage in 1586, and a Report of Master John Davis of his three voyages made for the Discovery of the North West Passage were printed in Richard Hakluyt's collection. Davis himself published The Seaman's Secrets, divided into two Parts (London, 1594), The World's Hydrographical Description... whereby appears that there is a short and speedy Passage into the South Seas, to China, Molucca, Philippina, and India, by Northerly Navigation (London, 1595). Various references to Davis are in the Calendars of State Papers, Domestic (1591-94), and East Indies (1513-1616).